Looking to plan one of the coolest birthday parties for your child? Then you may want to consider a Barnyard Animals Party. There are so many ideas to make this birthday party theme unique and special for your child. Here you’ll find ideas for invitations, decorations, food, activities and treat bags. Get ready to party until the cows come home! SimplyBirthdayStuff.com has so many cute and unique ideas for almost any theme you can think of for your child. 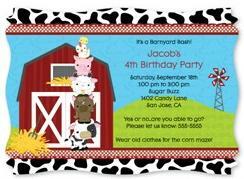 Their Farm Animals theme is perfect for a Barnyard Animals Party. Their unique squiggle invitations (featured below) come with 11 lines of personalization. The return address labels are a nice added touch. If you have access to a place to purchase hay, it’s an excellent decor idea for a Barnyard Animal Party! If you don’t have access to a barn, the backyard or garage would be a great place for some of the party festivities. Red & white decor (such as streamers, table cloths and balloons) are a perfect fit for this theme. Check your local dollar store for red & white checkered table linens. Farm animal print balloons (or even just a cluster of white and black) are a nice added touch as well. Metals pails are a fun idea either for decor or to serve some of the food items out of. One of the great things about a Barnyard Animals Party is that any sort of BBQ is a perfect fit with the theme. White & red table decor are a perfect match. For dessert snacks, you can create some delicious Chocolate Coconut Macaroons and place them on a tray labeled “Cow Pies”. Another idea is to create crispy rice marshmallow treats, place them in muffin tins, push down on the middle to create a little dip, add in a few chocolate mini egg treats then let them set before removing from the tin – create a label called “Chicken Nests”. Set aside an area with a small dance floor, some hay along the side as decoration, and host a small “Barn Dance”. You can play some country music and teach the kids some line dancing & the chicken dance. This is sure to be fun for everyone! Do you have cowboy entertainers for hire in your city? This would be an entertaining addition for the kids! Is there a company that has small petting zoo animals for parties? Consider bringing in a few small animals & their owner for a little visit. Find a cartoon image of sheep and print off quite a few of them. Post them up around the party area on the walls, the furniture, under tables, etc. and tell the kids that you’re having a “Sheep Herding Contest”. Blow a whistle and the kids must scatter to find and grab as many sheep as they can within a short time frame. The child who “herded” the most sheep wins a small prize. A great addition to any party is a pinata. 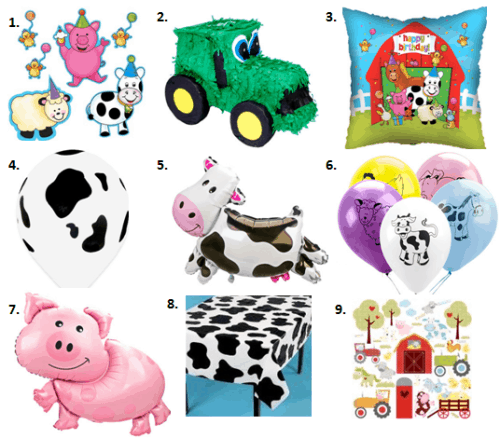 A farm animal pinata would be a fun activity for the kids. If you have a place to buy hay from (or you could use a bunch of shredded paper as hay) you could have a “Find The Needle In The Haystack” contest. Rather than use a small dangerous needle, you could use something else small like a needle shape cut out of thick paper. Hide this in the hay let the kids dig through to find it. The first person to find the “needle” is the winner. 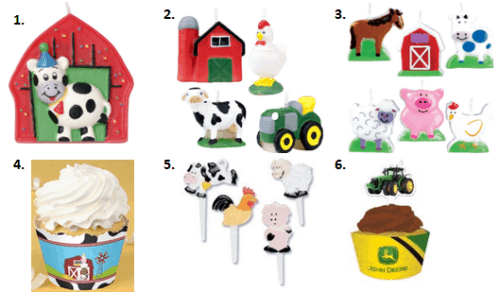 What’s your favorite barnyard animal? 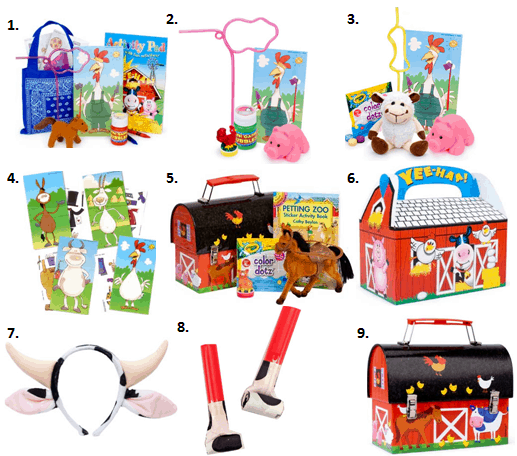 For more cowboy, western and farm party ideas, visit our special Farm category. Stay updated on the latest ideas for parties and family fun by following along on Facebook, Twitter, Pinterest and Bloglovin’. *Disclosure: I am part of the Amazon.com, Big Dot of Happiness, Birthday in a Box and Tiny Print Inc. affiliate programs.